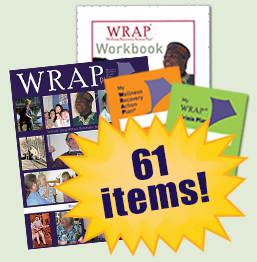 The WRAP Plus Group Bundle includes WRAP Plus, 20 WRAP Workbooks, 20 My WRAP and 20 My WRAP Crisis. The WRAP Plus Group Bundle provides great resources to share with support groups in one convenient bundle. If you bought the items individually they would cost $199.95. We bundle it together for only $180.00 – Buy the bundle and SAVE! This book includes intensive instructions-not found anywhere else-on how to develop a WRAP that will work for you, and how to “live WRAP” on a day-to-day basis. Filled with ideas for successfully developing, using and updating the popular Wellness Recovery Action Plan for prevention, recovery and wellness, this book includes stories from those who are living WRAP to stay well and are learning to anticipate and address life’s hurdles.